[By Nick] I don’t know what has been up with me as of late. I never usually buy just plain vanilla ice cream but after my pleasant experience with Clemmy’s and my life-altering experience with Talenti, I’ve been on a vanilla kick. This time though, I’m going to be looking at a vanilla frozen yogurt since it was suggested I give it a try. Stonyfield has been a player in the freezer albeit it a small one but they do make a good frozen yogurt. Their minty chocolate chip was actually the flavor that got me into trying more mint flavored desserts (possible review in the future?) So with my willingness to fulfill most reasonable requests, I picked up a pint of Stonyfield Gotta Have Vanilla on my last grocery trip. I really like the background image on this pint. It gives you a feeling of the farm in which the milk was produced to create this treat. There’s the token vanilla flower on the label which is always a pleasing sight. 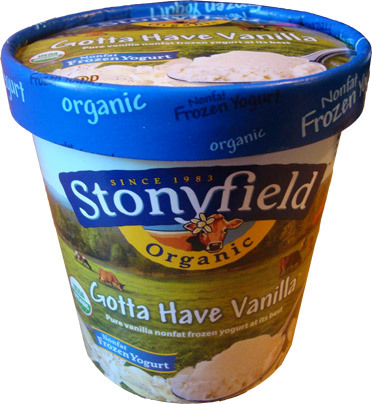 Oh wait I just noticed the cow under the Stonyfield has a vanilla flower behind its ear. That designer definitely earns some points in my book. Described as “Pure vanilla nonfat frozen yogurt at its best” Stonyfield sure isn’t holding back with the claims Also on the side of the pint, Gary who I’m guessing is one of the founders, goes on to say that he has given us vanilla perfection. I’m all for confidence in your product as long as you can back up your words so this better be some good frozen yogurt. Even before removing the protective seal, I was able to see tiny specks of vanilla bean. The positive visual translates over to the flavor as well. 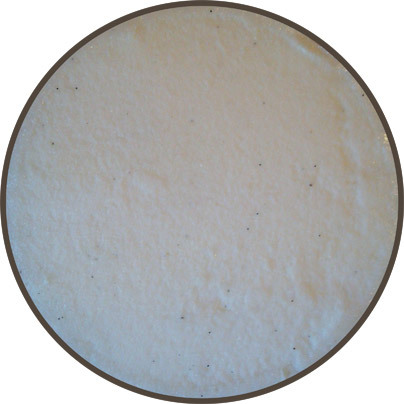 The vanilla is very clean but not as intense as I would have liked. It actually reminded me of vanilla soft serve in the fact that it was very sweet, though I think the sweetness is what is tempering the vanilla flavor from truly shining through. This isn't so much a bad thing though, especially if you’re looking for a healthier base for making sundaes and the like. For something that has no fat, this stuff is ridiculously creamy and dense. The texture is better than a lot of “regular” ice cream I have had as of late to be honest. If I hadn’t known it was froyo, I wouldn’t have thought it wasn’t ice cream at all. I still can’t get over how smoothly this stuff scoops. Too often froyo is plagued by iciness but that’s not the case with this one. Good job on this one Stonyfield. It’s not quite vanilla perfection but it’s still pretty darn good. Verdict? A nice vanilla frozen yogurt albeit a bit on the sweet side. Their cookies n cream didnt win me over, but maybe the cookies were getting in the way and messing with my expectations. I'm half tempted to try another pint. You know, that is actually the only flavor of their froyo I haven't tried. Way too sweet for me. Disappointed.